Wedding Anniversaries are special occasions, especially the 40th Anniversary and many of my friends are celebrating those lately. I know, that makes me pretty old, but I consider the alternatives and feel very fortunate! 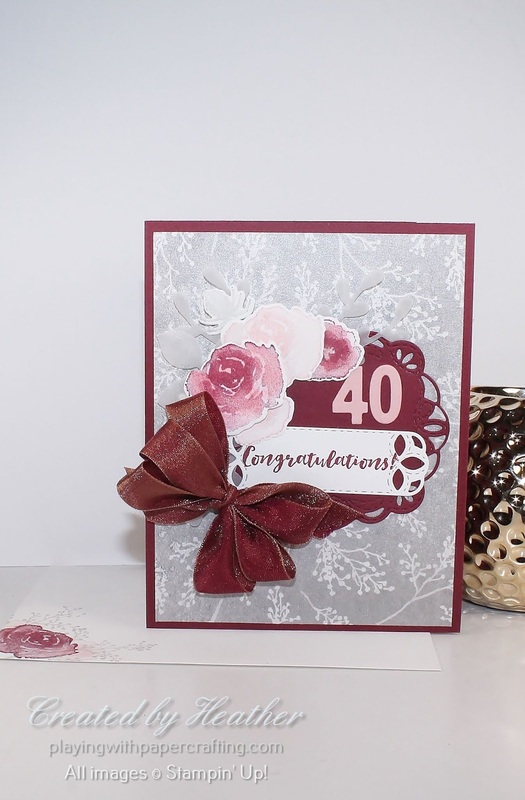 I went to a 40th celebration this weekend and created a card for the couple using my new favourite suite - the Frosted Floral suite from the Holiday Catalogue. I think you'll agree that it's beyond gorgeous when you see what it can do. 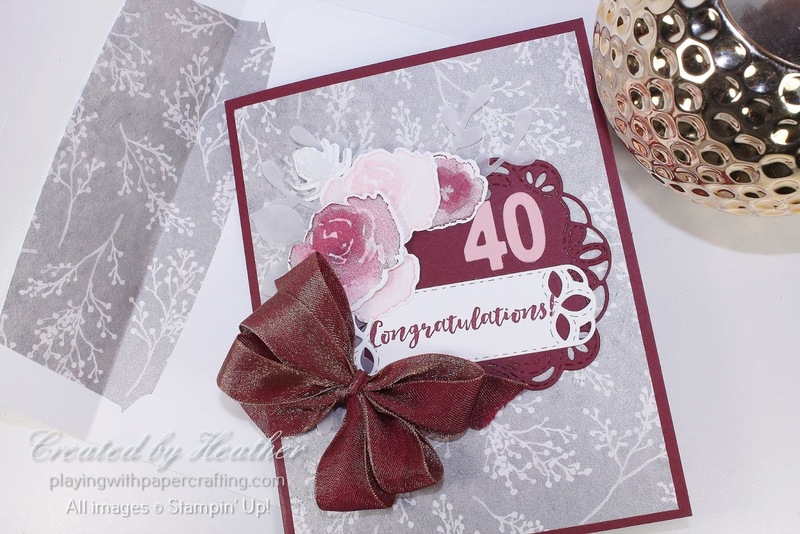 Since the 40th anniversary is deemed the Ruby Anniversary, I chose Merry Merlot as one of my palette colours along with Smoky Slate and Blushing Bride. The stamps from the First Frost stamp set work beautifully with those colours. The background paper is from the Frosted Floral Specialty Designer Series Paper. What is hard to see here is that it has a real shimmer to it that makes it irresistible! This design in Smoky Slate was a perfect background for the design I had in mind. I used the Leaf Punch and the new Sprig Punch to create foliage for my rose spray on the card. Punches are so quick and easy and I'm happy to see Stampin' Up! bringing a few more of them out! These are all punched from Vellum. I put the beautiful Stitched Labels Framelits to good use for my sentiment, which is from the First Frost stamp set as well, and for the Merry Merlot label behind it. 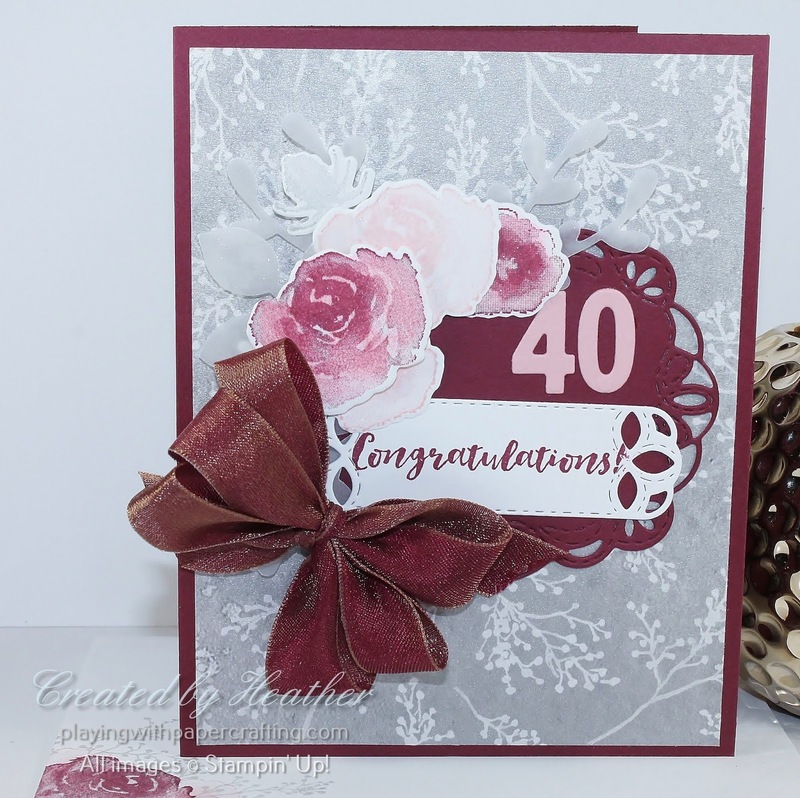 All the images I stamped with the First Frost stamp set were die cut with the Frosted Bouquet Framelits. If you live in Canada and don't have a regular demonstrator, I would be happy to help you get your hands on some of that gorgeous paper! Contact me or shop at my On-Line Store!